Level up my Splatoon,Smash 4, and Mario Kart 8 cards if you want! You're right, I must have skipped it by mistake. It's fixed now. Thanks for mentioning it. Is it possible to add Japanese to these? I have my Mii name in Japanese, but when using it on these cards, the Japanese will show up as question marks. Yeah, I noticed your card had weird symbols instead of Japanese when I checked your profile a few hours ago. I'll see what I can do about it. The problem is that the font needs to have all the symbols included. It was already hard to find one that included symbols like stars and other stuff. (The profile page doesn't have that issue because your computer automatically detects Japanese characters and switches the font) If I can't find a solution that works for all cards in general, I'll make a solution that at least works specifically for your card. Also, wanted to announce that yesterday I also added the two new DLC weapons and I noticed that some people where having problems with the Squad field. I increased the limit of it to 20 characters, iirc, so please try editing and reentering the name of your Squad if it was showing incomplete. 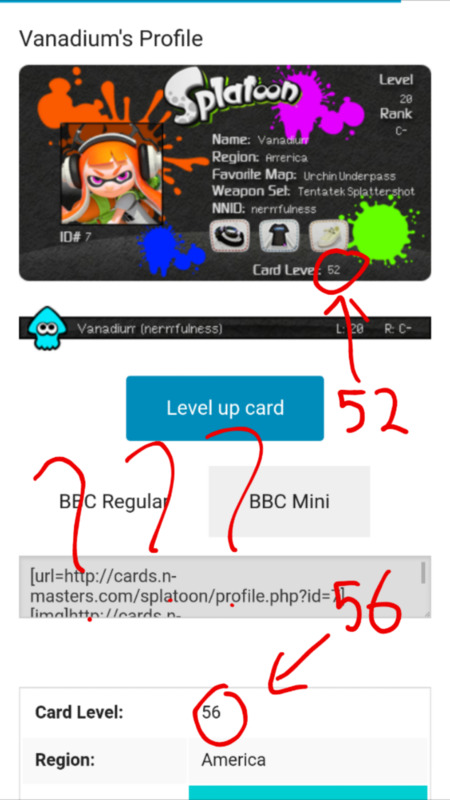 Going for the #1 Splatoon card! When will the squads be shown on the card? The current places I'm thinking is either slightly above the portrait or below the ID number. I'm leaning more towards the second one atm. Maybe it could be at the same height as the Card Level? Your suggestions and opinions are welcome. Can I put in a request for the White 8-Bit Fish Fry shirt and Red Hi-Tips shoes? Also, wanted to do a small announcement of the current plans. First, like I mentioned already before, there'll be Squad pages. Also, I did some tests with the favorite ink color and it'll probably start appearing in the regular cards too. Sadly, there's an issue I didn't expect when I was designing the application, so there may be few issues while I'm enabling the feature. I'll try to do everything in one go, though, so hopefully no one will have any problem while this is happening. Besides that, here's what I'm thinking about Squad info appearing on the card. Those areas that I circled is where I'm thinking it can be placed. What do you think about it? I would put it on the bottom. jell0! (hello) ya I taken a liking to the cards and share my cards and use it to set out my favorite stuff, also recommended the cards to a load a people and also got a load of people to like my cards XP looking forward to future updates and such! Just simply a dead man that came back from the dead...FEAR ME!!! Um Hi Those cards are cool I want one! This isn't my card, but I found an error on someone else's card. That's an interesting error. (Btw, the level on the table is the real one) I'm pretty sure I know what's going on there, but I don't know what triggered it and my log doesn't have that data anymore. It's similar to a previous bug that happened when you leveled up a card. That bug was fixed though. (I just tested to make sure) I would need [member=1981]vanadis[/member]'s help to discover what is he doing when the bug happens. More gear added! Going to test favorite ink color on inklings now. Update: Ink color and squad is now displayed on the card. Yep, the ink color may look a bit rough atm, specially certain colors. It can be easily fixed, don't worry. Feel free to comment which ones look off here. Inkling girls now have the ink color fixed.